FootGolf is open 7 days a week starting at 2:00 PM. Adults and kids of all skill levels are welcome. We challenge those parents and coaches of junior soccer players to bring out their soccer teams. We already have teams coming out on a weekly basis. For more information on the sport contact the FootGolf tab on our website our reach out to a professional staff member in the El Prado Golf Shop. Our $25 Golf Special has been extended int0 December 2015. Enjoy an 18 hole green fee and cart fee for $25 Monday – Friday starting at 10 am. Reservations are not required, but are recommended. Enjoy this offer from 12/1/15 until 12/18/15. **May not combine special with any other offers. Every weekend they gather on the first tee in the pre-dawn darkness at El Prado, ready to complete a round of golf before the vast majority of us are even out of bed yet. It’s dark out there. There’s no chance to warm up, other than stretching, although a few do try to hit a couple of practice balls into the dark to try and get the feel of their golf swings. Others have tried attaching portable lights to their golf bags so they can see to practice putt. They don’t wait for the sunrise. As dawn breaks they tee off into the semi darkness, depending on the feel of the ball striking the clubface to tell them where to look for their golf balls. By the time they finish the first hole or two there is enough daylight for them to see the course waking up before their very eyes. The setting is so peaceful and serene. The solitude and beauty of the golf course is calming and exhilarating. And then the sun finally peeks over the mountain top in the distance and the sky turns wonderful shades of colors. It’s almost spiritual! It feels good to be welcoming in the new morning while the world wakes up. The birds, squirrels, ducks and geese are all happy to see them. Only the coots are not. The air is crisp, it’s nice and quiet out there and the course is pretty much empty. There’s virtually no wind, the freshly mowed greens will always be rolling as true as they will all day long and there are no footprints yet to be avoided. The fairways are pristine first thing in the morning. The dew and water from the overnight sprinklers coats the grass. This is no place for a golfer without waterproof shoes! But make no mistake. This is not a leisurely round of golf. This is ready golf on steroids. Their goal is to play a round of golf in less than 3.5 hours and players have to hustle to keep up with the pace of play. Their mantra is “keep moving or get out of the way” especially when they catch up to the back-niners. This early morning golf culture at El Prado began when the course first opened in 1976. Lynn Dudley and Yusaku Ishibashi were among the first to assemble their own groups to play. Nearly 40 years later Ishibashi is still on the tee nearly every Saturday with his gang. And although Dudley no longer plays, his buddy Don Brisbin, from that same original group, has his own collection of players following Ishibashi off the tee. Through the years others at El Prado have found this early-morning golf idea appealing. Presently, groups championed by Dennis Goheen, Jay Banner, the Stuart Brothers, Dean and Ronnie, and Damon and Paul have all joined the mix. So why have these guys been out there playing virtually every weekend for years at 0-Dark-Thirty? What possesses them to ignore sleep time in favor of being able to tee off before its even daylight? You see, the vast majority of early morning weekend golfers play at that time because a round of golf can be completed in less than 3.5 hours. And that leaves them with the entire rest of the day to accomplish whatever needs to get done. Many say they play early on weekends so they can free up the rest of the day to spend time with family and friends. For others there are the “Honey-Do Lists” that require early morning golfers to be back home with plenty of time remaining in the day to work on them. And then there is the camaraderie, that spirit of good friendship and loyalty that develops among the players in the groups. A early-morning round of golf helps keep everyone in touch with what is happening in each other’s lives. Combining a love of golf with the chance to socialize with friends they care about is a wonderful way to spend a morning. They can fit in a lot of conversations during 3+ hours on the golf course. The rounds create an ideal way to provide a much needed break from the cares and stresses of every day living. The emotional refreshment provided by playing a round of golf often makes it easier to think through difficult situations, discuss issues with their friends and perhaps even discover a solution after spending time away from the matter. Regardless of the motivation for being out there, the fact is players are willing to forsake sleeping in so they can play the game they really love (and sometimes momentarily hate). Having the course to themselves, the fresh morning air and the beautiful sunrises most people sleep through are all benefits that keep them coming back for more. Calling all kids age 7-12! Join us for group golf lessons on Sundays this Fall. Rick Hunter’s Jr. 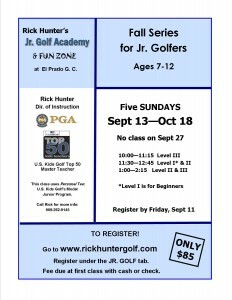 Golf Academy is one of the finest junior golf programs in the southland. You kids are in good hand with a former Inland Empire PGA Teacher of the Year and U.S. Kids Top 50 Master Teacher. 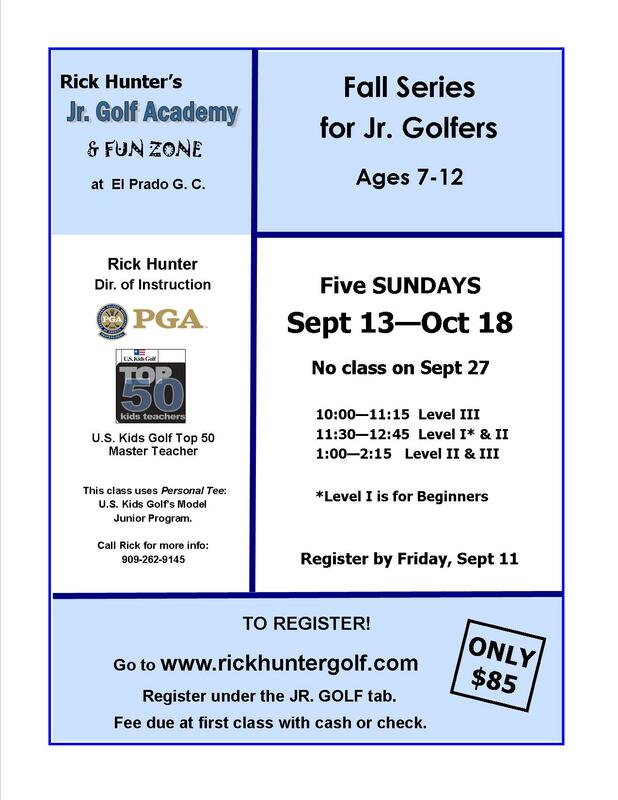 To register your child or gather more information, contact Rick Hunter.You can email Rick directly and he will be happy to help. Level 1, 2, and 3 classes offered. All are subject to availability. Email Rick today before they are full. Summer Golf League Season 3 has been such a great time! Each and every Wednesday we had the privilege of getting 60 players out for this mid-week competition. With 10 weeks of competition, it’s time for playoff. The top 8 teams from our A-flight and 8 more from our B-flight have qualified for this bracket-style playoffs. In just 2 and a half weeks, we will be crowning our winners. Thanks to all of you who have competed. For those of you who missed out on the fun this season, we will be back for again next year with Summer Golf League Season 4. It will be our biggest and best season yet. Sign-ups open on March 1, 2016. Copyright © 2019 El Prado Golf Course All Rights Reserved.